Violation of a Protection Order 18-6-803.5 (2) (a). 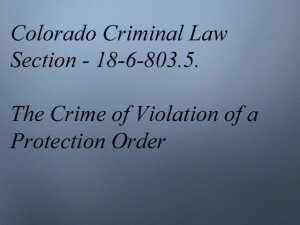 This web page contains the elements of the Colorado Crime of Violation of a protection order 18-6-803.5 (2) (a). Domestic Violence – Violation of a protection order 18-6-803.5 (2) (a). 18-6-803.5. 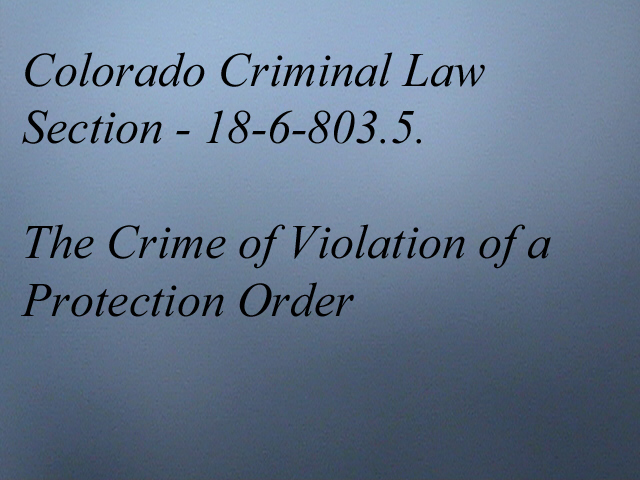 Crime of violation of a protection order – penalty – peace officers’ duties. (II) Failing to timely file a receipt or written statement with the court as described in section 13-14-102(22)(i), C.R.S., or in section 18-1-1001(9)(i) or 18-6-801(8)(i). (2)(a) Violation of a protection order is a class 2 misdemeanor; except that, if the restrained person has previously been convicted of violating this section or a former version of this section or an analogous municipal ordinance, or if the protection order is issued pursuant to section 18-1-1001, the violation is a class 1 misdemeanor. (3)(a) Whenever a protection order is issued, the protected person shall be provided with a copy of such order. A peace officer shall use every reasonable means to enforce a protection order. (6)(a) A peace officer is authorized to use every reasonable means to protect the alleged victim or the alleged victim’s children to prevent further violence. Such peace officer may transport, or obtain transportation for, the alleged victim to shelter. Upon the request of the protected person, the peace officer may also transport the minor child of the protected person, who is not an emancipated minor, to the same shelter if such shelter is willing to accept the child, whether or not there is a custody order or an order allocating parental responsibilities with respect to such child or an order for the care and control of the child and whether or not the other parent objects. A peace officer who transports a minor child over the objection of the other parent shall not be held liable for any damages that may result from interference with the custody, parental responsibilities, care, and control of or access to a minor child in complying with this subsection (6). Violating a protection order after having been previously convicted of violating a protection order or an analogous municipal ordinance, or violating a protection order issued pursuant to section 18-1-1001 concerning mandatory protection orders is a class 1 misdemeanor.